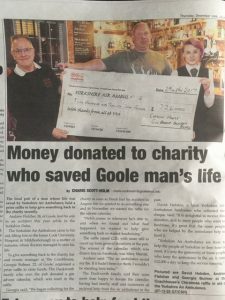 Pickup a copy of this weeks Goole Times to see our feature on the money Georgia and her team at The Coach House raised for Yorkshire Air Ambulance with the Gin Advent Calendar Raffle! Yorkshire Air Ambulance is an amazing charity who we are still raising money for! Call into The Coach House, enjoy one of Gee's lovely Christmas gins and make a donation to Yorkshire Air Ambulance at the bar in our collection bucket!